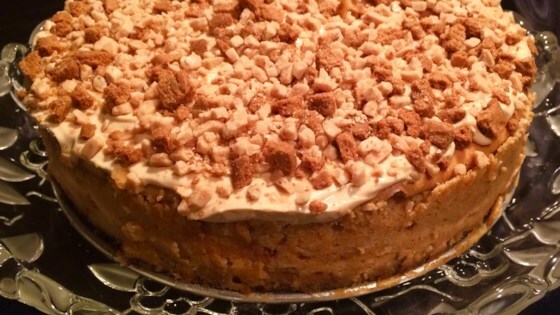 "Cookie butter and speculoos cookies are used to make this spectacular cheesecake that will surely impress your guests." Preheat the oven to 425 degrees F (220 degrees C). Wrap the bottom of a 9-inch spring form pan with aluminum foil to create a water-proof barrier. Pour water into a large baking pan, filling it 1/2 inch deep, and place it in the oven to create a water bath. Set aside 6 cookies for the topping. Break up the remaining cookies and place in a blender. Pulse several times until the cookies have turned into uniform crumbs. Combine softened butter and cookie crumbs in a bowl using a fork or pastry knife. Add mixture to the prepared springform pan and evenly press them into the bottom to form a crumb crust. Refrigerate while preparing the filling. Combine cream cheese, sugar, cookie butter, vanilla extract, and ground ginger in the bowl of an electric mixer. Mix to combine on medium-high speed; mixture will be quite thick. Add eggs one at a time, beating well after each addition. Scrape the bowl with a spatula as needed. Stir in toffee chips. Remove springform pan from the refrigerator. Pour filling on top of the crust, using a spatula to even out the top. Carefully place springform pan into the water bath, adding more hot water if necessary. Bake in the preheated oven for 12 minutes. Reduce oven temperature to 350 degrees F (175 degrees C) and bake until the top of the cheesecake is golden brown, 50 to 60 minutes. Add more hot water as necessary, since there will be some evaporation. Remove cheesecake and place on a wire rack to cool to room temperature, about 1 hour. Whisk sour cream and 1/2 cup cookie butter together to make the topping. Spread topping on top of the cheesecake and garnish with 1/2 cup toffee chips. Crumble reserved cookies over on top. Refrigerate for at least 4 hours before serving.